Cardiff Blues centre Dafydd Hewitt has been forced to retire because of a neck injury. The 29-year-old made 122 Blues appearances since his 2006 debut, having arrived from Cardiff RFC. 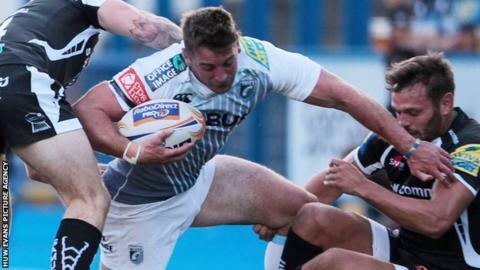 "It is hard to put into words how I am feeling at the reality of never wearing my Blues jersey again," ex-Wales Under-21 captain Hewitt told Blues' website. "No rugby player expects to be told that they can never again play the game they love; it's the worst feeling." Hewitt was a member of the Wales Sevens squad that won the 2009 Rugby World Cup in Dubai. After making only two appearances in 2014-15, Hewitt said: "It was my childhood dream to play rugby for the Cardiff Blues, the team I followed as a boy and dreamt of representing. "I have loved every moment of being a Cardiff Blue and knew early on that it was a club I never wanted to leave." Blues chief executive Richard Holland said of Hewitt: "He has been an outstanding servant both on the field, including a spell as vice-captain, and off the field where he has been a true role model."